I am research engineer in Advanced Driver Assistance Systems and researcher in Human-Computer Interaction. After my Ph.D. on Whole Body Interaction with Public Displays at Quality and Usability Lab of Telekom Innovation Laboratories and Berlin Institute of Technology, I joined the Technology and Innovation group at Siemens Mobility. In the framework of InnoTrans 2016, the world’s largest trade fair focused on the rail transport industry, we presented some of our recent work at Siemens on the “Digital Train” exhibit. Together with David Lindlbauer, Klemen Lilija and Jörg Müller, we received an Honorable Mention Award at CHI ’16 for our paper Influence of Display Transparency on Background Awareness and Task Performance. Awesome work, everybody! After a little more than four years of working and publishing on my topic, I submitted my PhD thesis on Whole Body Interaction with Public Displays today! Together with Viktor Miruchna, David Lindlbauer, Jörg Müller, Maren Lehmann and Regine von Klitzing, we received an Honorable Mention Award at UIST ’15 for our paper GelTouch: Localized Tactile Feedback Through Thin, Programmable Gel. Congratulations, you guys! Today, I attended the Doctoral Consortium at CHI’15 in Seoul. It was a great opportunity to get feedback on my thesis work from important HCI people. During my time at T-Labs, I conducted the exercises and the projects of the Mobile and Physical Interaction module (2011 to 2014) and the Multimodal Interaction course (2015) of Quality and Usability Lab of TU Berlin. Each year, 50 to 70 students attended our lectures. Besides, I supervised a series of master theses in Human-Computer Interaction. Within 7 weeks, students go from brainstorming ideas and defining personas of the target audience, over storyboard, conducting interviews with potential users, paper prototyping, to the first iteration of a software prototype. The prototype is then redefined using methods of heuristic evaluation and a think-aloud user study. Students document the progress of their work in a project blog and submit a video demonstrating the design process and interaction with their prototypes. The following montage shows example projects of one semester. 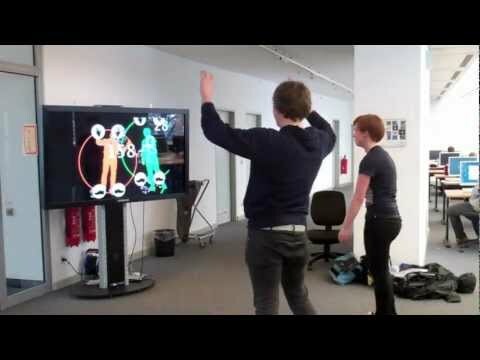 In the exercise, students learn the basics of the famous creative coding environment Processing and get introduced to natural user interaction using the Kinect Camera and the OpenNI framework. Using these tools, students practically apply the interaction design process taught in the lecture and create small projects in groups. The task is to create an intuitive yet engaging interactive public display application. The following projects on the topic Interactive Waiting Area Experience are examples of great projects. Note that the projects displayed here are not my work but the result of student projects of our HCI course! You play a drunkard: shift your body and try not to tumble! The students later released an Android version of their prototype. A Southpark-themed racing game that you control by bending your body. You can also throw snow balls! Players have to place specific body parts on predefined, moving targets on a circle around their body.